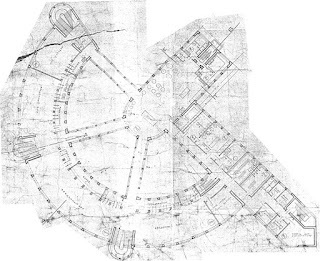 In spring 2007 I went to Samara, a city some 500 miles south east of Moscow on the Volga River, to look at the Maslennikov factory canteen (1930-1932) by one of the few female architects of the Soviet avant-garde, Yekaterina Maximova. 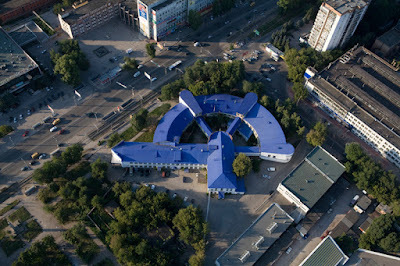 It has a ground plan in the form of a hammer and sickle and, despite years of neglect, is a monument to the innovative period in which it was built. 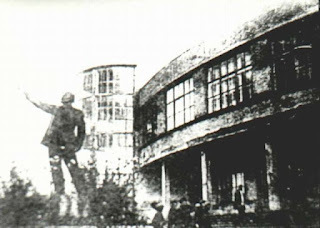 A press conference was held by the Hammer and Sickle Movement, defending the factory canteen from demolition. I was struck by their determination to defend a period that had been so unfashionable for most of the Soviet era. In 1918 Lenin called on artists to create ‘monuments to the Russian socialist revolution.’ The factory canteen, with its architecture parlante, fulfilled this beautifully by providing a necessary function and celebrating the revolution. Factory canteens were intended to free women from the shackles of domestic duties, allowing them to devote their energies to the building of the Soviet Union. Samara (then Kuibyshev) was the capital of a large agrarian area, busy building enormous factories and becoming an industrial centre. Food was cooked in the ‘hammer’ and transported on conveyor belts to the ‘sickle’ part of the building. Cheap, hot meals were served all day and there were also rooms where the builders of the Soviet Union could relax: a reading room and a gym. Maximova’s factory canteen has a reinforced concrete building frame, due to a lack of metal. This was one of the first in the city, an example of how shortages forced architects to test the boundaries of their materials. The Soviet avant-garde was a time of explosive creativity. In art as in society, everything was turned on its head: old ways of seeing and creating were rejected and replaced with new forms that harnessed new technology and the revolutionary spirit of the time. The avant-garde period was high on energy but it was also one of extreme poverty and hardship. Constructivism was rejected under Stalin, and existing buildings sometimes adapted. In 1944 the factory canteen was given a classical re-working: its predominantly glass facades were filled in and windows given classical forms. These distortions of architectural form and the negative associations with the era, mean that developers now wishing to sweep away architecture of the avant-garde, are baffled by any movement to stop them on the part of the public. The developer wishing to knock down the factory canteen invited the head of the Hammer and Sickle Movement, architect Vitaly Stadnikov, and myself to dinner in an elegant post-war modernist building (which he announced over pudding that he also intended to demolish) and probed us to try and understand why we were interested in the building. In the spirit of the avantgarde, Stadnikov said, ‘we are enthusiasts.’ The developer found it hard to believe that we were not on somebody’s payroll, and the conversation ended. Samara is the sixth Russian city in terms of population and was chosen as the emergency capital during the Second World War, when many ministries were evacuated there and Stalin had a deep bunker constructed. Samara was a ‘closed city’ during Soviet times due to its arms production sites. Since the fall of Communism, it has lost approximately one third of its historic buildings, and corruption is rife. Architecture and planning is a dangerous business: the head architect of the neighbouring town Togliatti was assassinated five years ago. In the first years of post-Soviet capitalism, there was a rush for the best plots of land in the city; the embankment became built up with high-rise buildings for a new middle class, architectural monuments in the historic centre were regularly razed to the ground in mysterious fires. Despite this rush for profit and desire to establish a new set of symbols for the city, there are still many people who feel that witnesses of 20th-century history like the factory canteen must be saved. The campaign has support from UNESCO, DoCoMoMo, SAVE Europe’s Heritage and Russian charity MAPS (Moscow Architecture Preservation Society) and has led to a book on Moscow by MAPS and SAVE, published in December 2009. The editor, Stadnikov, has rallied Samara to think of new ways to reuse buildings like the factory canteen: victims of Russia’s turbulent history. This determined campaigning continues the spirit of the avantgarde. If the era’s buildings are embraced in Samara, they will be a rich source of inspiration for future generations. Really nice and definitely it will be useful for many people. Kindly keep update like this..